From innovation to pariah to being part of the solution, the payday loan industry has, to many financial and social commentators, come a long way on a very bumper rollercoaster ride since its birth in the mid-2000s. The high-cost finance market is surely one of the defining societal and business stories for our age – an age marked by financial turbulence and near meltdown, austerity, the gap between rich and poor widening, technological innovation, and the birth of a new sector – FinTech. CashLady, one of the UK’s leading payday loan market brokers, looks back and looks forward to the future of the high-cost finance industry in Britain and around the world. The growth and decline of the high-cost credit industry happened over a short ten-year period. It was 2008 – the year of the financial crash. British household incomes would lag the rate of inflation for many years to come. A public sector pay freeze was implemented in 2010 followed by a public sector pay squeeze from 2016. The recession in Britain was even deeper than it experienced during the Great Depression of the 1930s. Britain and British consumers were in trouble. Banks stopped lending. The central bank base rate went to its lowest level since the 17th century to try to protect to consumers and businesses from the worldwide economic headwinds caused by collapsing domestic and international trade and governments propping up financial institutions. At the same time, the internet had begun its move from the desktop to the mobile phone with the invention of the iPhone in the previous year. Data was being accumulated in greater amounts than ever before and algorithms were developed to determine whether someone could pay back a loan they wanted or not by examining incredibly complex relationship datasets. The machines making these decisions could come to an answer in seconds, not days. This was the birth of “FinTech” – financial companies reliant on new forms of technology to do business. And the first bigFinTech companies were in payday and short-term loans. Before 2008, around a quarter of a million people, a year used short-term loans. As the noose tightened around consumers’ finances during and after the crash, the sector experienced year on year exponential growth. What had been a niche sector four years before now lent out £2.2bn in 2012 across nearly 8 million loans taken out by 1.8 million Brits. 240 lenders competed for business lending out a sixth as much as UK credit card companies. Payday and short-term loan borrowers carried around £1,200 worth of debt per person to companies in the sector. Many lenders became over-reliant on their data models, refusing to change them even as it became evident that some of their assumptions about borrowers’ ability to pay back were wrong. People struggled to repay their debts and many lenders used high default rates and penalties fees to take as much money from their distressed borrowers as possible. The sector was unregulated, and many lawmakers saw the payday loan industry and the short-term loan industry as credit’s Wild West. Perhaps the most memorable headline of the era was The Guardian’s “The payday lender that charged 16,734,509.4%”. Controversy surrounding the sector mounted and something surely had to be done. In 2015, something was done – the Financial Conduct Authority took over the regulation and policing of the sector. New rules came in on how loans were advertised, interest rates and penalty fees consumers could be charged, and how accounts in arrears were handled. A third of lenders dropped out of the market immediately because the profits to be made became much smaller and regulatory requirements that needed to be achieved made it harder and harder to make a return. Who are the leading players in the high-cost credit sector? The leading players in the high-cost credit sector are those companies which chose to remain in the payday loan market having changed their business models to suit the new environment. They have made considerable adjustments to both the offers they make to customers and the customers they make those offers to. It is now much harder for borrowers to access payday loans in the UK. There were 1,400 High Street shops – that number is now down to 500 at recent count. Up to date figures, on the leading players in the sector are currently difficult to come by. The Bureau of Investigative Journalism carried out research back in 2013 on the largest companies in the high-cost finance industry. Wonga lent £309m in 2013-2014 followed by QuickQuid/Pounds To Pocket, followed by The Money Shop in third place. 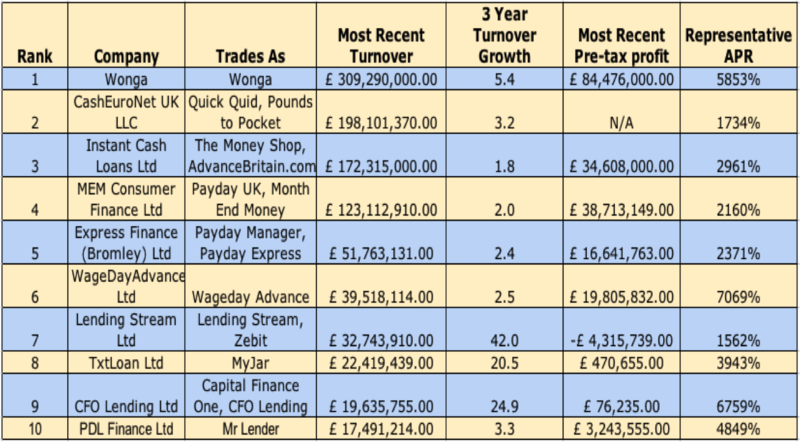 CashLady, one of the UK’s leading payday loan brokers, published research in March 2018 to suggest that the top 3 lenders back in 2013 were still the top 3 today based upon analysis of their own internal sales and enquiry figures, albeit in a slightly different order. The company concluded that “the ten largest lenders hold 90% of all market revenue”. Are new lenders entering the UK payday loan market? Yes, there are new lenders entering the UK payday loan market with new approaches to the market and new lending propositions to offer to borrowers. A quick Google search for “new payday lenders” will take you to many of their sites. The 2015 FCA regulations governing both the payday loans market and short-term loans market not only reduced the competition in the sector, they made it more difficult for newer companies to enter the sector. Something else which has made it harder for new entrants is recent advertising restrictions, particularly those put in place voluntarily by Google. Google no longer allow companies to use its Adwords platform to advertise loans where repayment was due in full within two months – click here to read WIRED’s coverage of the ban. Has the short-term credit industry expanded geographically? The short-term loan industry has expanded geographically but it’s not as widespread as you might think. When most of the people in a country have a bank account and most people have access to smartphones, the more advanced that country’s financial system is likely to be. For a payday credit market to exist, a country needs to be technologically advanced with a well-developed banking system. Where these conditions don’t exist, it’s not possible to perform the credit checks needed on borrowers and there is no bank account into which a loan can be paid and from which the repayments can be taken. Many countries do not permit the type of loan that a payday lender or a short-term lender provides by law, even if they have banking, technological, and regulatory systems that could support it. That said, technology moves faster than most governments and regulators. The first big wave of FinTech for consumers was in the short-term loan industry and payday loan market. It will be interesting to see what the second wave will be. What are the main changes on the high-cost finance market? Before the FCA, there was very little regulation in the sector and there was a need to make the payday loan industry fairer. Fast forward to present day and there is a lot of regulation a payday loan lender must follow before they agree to provide finance to a borrower. The regulation requires compliance and the Financial Conduct Authority, following the bad publicity the high-cost finance industry received in the earlier part of this decade, keenly watches all of the companies it has given a license to for non-compliance. Affordability checks are much more stringent than ever before. The checks made on borrowers before a loan is agreed to are much more thorough. There is a much greater use of credit reference agencies, the data from which has been used to modify the algorithms the lenders use to make a decision about whether someone can afford the repayments or not. The whole high-cost finance industry makes a point of telling potential borrowers who visit their websites or call them on the phone that any forms of short-term loans should only be used in emergencies and should never be used to settle other debts that they cannot afford to pay. Payday lenders and short-term lenders now add much more clarity to their website because they have to abide by something called the FCA CONC 3 – the Financial Conduct Authority’s very own manual on how to describe the types of finance they offer to consumers. There can be no encouragement to take out a loan – the text on websites must sounds as neutral as possible laying out in detail the costs of a loan and the consequences of not being able to pay it back. It has made a big difference to short-term credit brokers too. CashLady, as with all other brokers, must make clear whether they charge for their services or not. Most do not – instead, they receive a thank-you payment from the lender when they have introduced a suitable person to them for a loan and that person then took out the loan. Brokers must be as clear, concise, and as fair on their websites as the lenders are on theirs. Lenders are far more selective about the types of brokers they’re happy to use to introduce them to new customers because, if they make the wrong choice, there may be severe consequences imposed on them by the Financial Conduct Authority. Continuous Payment Authorities (CPA) (how customers’ repayments are collected) cannot fail more than two times – it is up to the customer to refresh their CPA. In the way that the recent introduction of the new data protection laws (GDPR) offer the consumer much more control over the information that’s held about them, the FCA 2015 regulations had a similar revolutionary impact on the high-cost finance market that continues to benefit borrowers to this day. The increased protections and the HCSTC price caps introduced by the Financial Conduct Authority have been widely viewed as a success by regulators and governments in 2017. In a complete turnaround, the 2015 regulations imposed on the high-cost finance industry, once the pariah of the financial world, have meant that the payday credit market is now considered to be a model for the future regulation of other types of finance. In August 2017, the Financial Conduct Authority reviewed the payday credit market, deciding to impose no further restrictions on the sector. It has begun a consultation on other forms of high-cost credit, including arranged and unarranged overdrafts, rent-to-own, home-collected credit and catalogue credit. You can see its latest progress report here. tougher new rules on how many times a loan could be rolled over. Are payday loan complaints on the increase? Payday loan complaints are on the increase despite the many positive and consumer-friendly changes made to the sector. Much of this increase can be put down to the rise in Claims Management Companies heavily and aggressively promoting their services. As reported in the Daily Mirror, complaints to the Financial Ombudsman about high-cost credit (including point-of-sale loans, hiring, leasing, renting, hire purchase, catalogue shopping, and instalment loans) went up by 40% to over 36,000 in 2017 with a 64% jump in payday loan complaints to over 17,000. However, the Financial Ombudsman’s statistics should not be a cause for concern but an indication that the market is working. Compared with five or six years ago when there was nobody for borrowers to complain to and there were no remedies, the consumer is now much better protected by the changes made to the industry. Borrowers, although they still need to be aware of their responsibilities when taking out any shorter-term loans, now have a right a redress – something not afforded to them before. And they are rightly using it. Increased use of the Ombudsman and increased and continued scrutiny on lenders and brokers will continue to improve payday loan industry best practice. How is digital innovation changing the payday loan industry? Digital innovation has changed the payday loan industry. Earlier, we considered what the second big wave in FinTech (financial technology companies) might be. It may be the increasingly popular revolving line of credit – a mixture between a bank overdraft and a credit car, referred to by some as an “evergreen loan”. The current leader in this field is SafetyNet Credit. eBay now offer loans to auction bidders on items which are sold for more than £100, allowing them to spread the cost of their purchase over 12 months. eBay’s payment partner uses many of the same systems, data, and algorithms used by the payday loan industry to offer credit to its customers. As our lives become more and more based on our internet activities, the FinTech industry is likely to continue to innovate to offer consumers and businesses more ways to pay for what they want. So, has all of the activity in recent years led to a new approach to lending? What has all this meant not only for the payday loan market companies but for the consumers who rely on it? According to the Consumer Finance Association, the cost of credit offer by high-cost finance market participants has fallen by a third. Default rates have halved as has the average amount paid by borrowers in add-on fees like default charges. Instead of taking out 6 loans a year as in 2013, the average borrower now takes out 4. For the companies still left in the industry, the story is mainly positive. While the amount of money that can be made on a payday loan has decreased, the number of companies competing for business has shrunk dramatically. The introduction of longer-term loans has given consumers more time to make repayments and, on longer loans, high-cost finance industry participants make greater returns. And, now that consumers don’t have to find the money all in one go (that is, their next payday), it’s easier to help borrowers pay back their loans because they’re now spread over a longer period. This is reflected in the figures produced by lenders – 80% of their revenue now comes come interest alone, compared with 60% before the new regulations. The average loan now lasts 80 days instead of the previous 30. In conclusion, while the high-cost finance market has, in the Consumer Finance Association’s word, “become a much smaller and less profitable sector…the focus (is) now…on issuing affordable loans and finding borrowers who are likely to be able to meet the contractual interest payments (within the context of the risk thresholds of the lender)”. What about borrowers? Speaking to the Evening Standard, the Consumer Finance Association chief executive, Russel Hamblin-Boone, is worried about “unintended consequences”. The number of people missing utility bills has risen “drastically” since the FCA regulations were introduced. “Those people shut out from short-term loans by tighter affordability checks are having to move to more expensive products which are not price capped and have not yet got the same regulatory scrutiny,” according to Mr Hamblin-Boone, expressing particular concern about guarantor loans, logbook loans, and unauthorised overdrafts. In an interview with the Evening Standard, Laura Rodriges, policy advisor to debt charity StepChange, expressed her concern, stating “(The people who contact the charity) say they missed their bill payments because if they didn’t they’d have no money to feed their children or pay for their travel to work…People are facing those impossible choices”. A previous financial services business owner, Mark is an experienced Copywriter, Speaker, Speechwriter and Coach. He has written for a number of websites, web applications and landing pages related to the financial sector, as well as writing a blog that is a humorous look at family life that has won numerous awards. Along with publishing a number of books, Mark often speaks about how to create and deliver consistently good content, often running courses on blogging and social media where he puts his extensive writing and financial experience to good use.